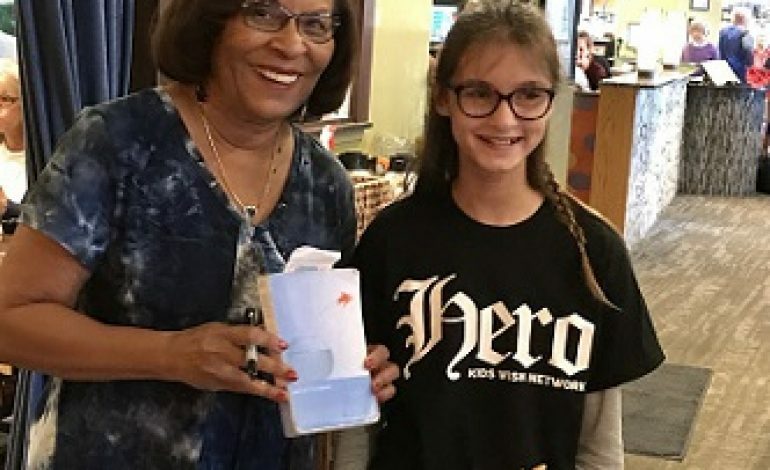 Kids Wish Network, a children’s charity that grants wishes for kids with life-threatening illnesses, got out their bookmarks and typewriters to set up an afternoon lunch with a child and her favorite author. Zoe Smith suffers from ulcerative colitis and eosinophilic esophagitis. Zoe was diagnosed when she was only eight years old, and must take medication every day to manage her symptoms. Zoe is a spunky kid that loves to read and write. Zoe enjoys writing her own stories in her free time. Her favorite book is Out of My Mind by, Sharon Draper, a fictional story about a girl who suffers from cerebral palsy. Zoe loves Mrs. Drapers books, and it was her wish to be able to meet and talk with the critically acclaimed author. Thanks to Kids Wish Network, Zoe met Mrs. Draper at Joseph-Beth Booksellers in Cincinnati, Ohio. There, the two had lunch at Bronte Bistro, a cozy café situated in a corner of the bookstore. While Zoe munched away on chicken fingers, she and Mrs. Draper discussed their favorite books, writing techniques, and life in general. Mrs. Draper also gave Zoe several of her own books and autographed each one. Mrs. Draper even gave Zoe tips on how to improve her writing, and use her own experiences of living with a life-threatening illness in her work. Zoe felt empowered talking with Mrs. Draper and really enjoyed the two hours she was able to spend with the author of her favorite book. After lunch, Zoe perused the vast collection of books while Mrs. Draper gave her suggestions of which books she would like best. Joseph-Beth Booksellers even donated books and other souvenirs for Zoe’s big wish day. After the big lunch wish, Zoe and her family went to The Cheesecake Factory in Cincinnati for a delicious dinner and a delectable desert to end her fantastic wish trip. Zoe and her family stayed at the luxurious Residence Inn by Marriott. Picture and story courtesy of Kids Wish Network. Click here to learn about Kid Wish Network’s different programs, and find out how you can help make dreams come true and sponsor a wish for a deserving child.